This week, a TV-budget-friendly version of the Royal Flush Gang rolls into town, Ollie gets visited by a specter (but not The Spectre) and Laurel tries to save her faltering legal aid office!I'm not one to tell the writers and producers of a television program how to do their job (OK, maybe I am), but it seems a little odd to me that this week's episode starts with a group of armed people in masks -- in this case, playing-card-themed hockey masks -- entering a bank and robbing it. Yes, bank robberies are standard fare for bad guys in stuff like this, but I'd think the makers of a DC Comics TV show would realize that an opening scene with so many similarities to the one that opens The Dark Knight would almost certainly draw comparisons, which are not likely to be in Arrow's favor. At least this one does play out differently. While the Royal Flush Gang's King and Jack clean out the safe, Ace keeps an eye on the hostages in the lobby. A plainclothes Starling City cop readies himself to take out Ace, but the secret queen of the gang, who's posing as a hostage, more or less points to him and says, "Police officer!" so Ace shoots the cop in the back three times. Of course, a bank employee hit the silent alarm a while ago, so a whole slew of cops arrive just as King chews Ace out for shooting the guy. In a pretty clever move, the Royal Flushers evade the cops by sending out all the hostages with approximations of their masks on. You might think that they'd also be clever enough to know that royal flush requires more than four cards, but they seem to think that's all you need. Maybe 10 will be a long-lost uncle in some future episode. At their escape hole (they drilled their way out), the Royal Flushers argue for a second about whether or not shooting plainclothes cops in the back is the way they do things before jumping into a blue van and scooting away. Maybe they drive it into a line of nearly identical blue vans to blend in as they leave. It doesn't show that part. In the Arrowcave, Ollie and Dig are training with those metal batons Ollie seems to be so fond of. Dig wants to know how Ollie learned all his sweet moves, and Ollie gives up Proto-Arrow's name: Yao Fei. Proto-Arrow doesn't seem to me to be much of an Accomplished Perfect Physician, but it's nice that the character from 52 got the nod, anyway. Ollie and Dig wrap up their sparring for the moment, and Ollie sets in on briefing Dig on the next target: the Glades' water and power baron, who jacks up prices and kicks people out of their homes when winter comes. But, Dig says, winter's a month away. (So it's OK if people get thrown out of their homes in November?) 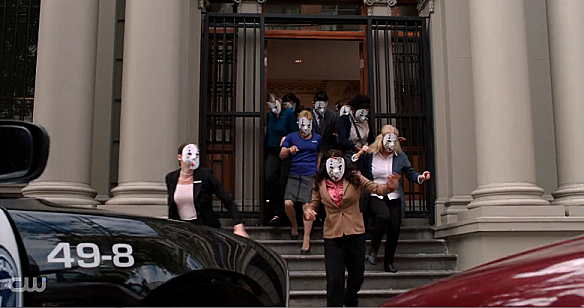 Why not take on these bank robbers with the card masks who shot a cop instead, he asks. Ollie's not too big on the idea. He wants to focus solely on the names on Dad Queen's magic list. He's just out to get those guys, not stop crime, per se. Dig tries some further convincing, but doesn't manage to get through before a flashback hits. 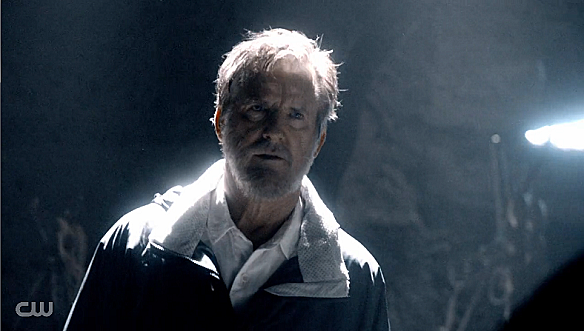 We pick up with past-Ollie where we left him last episode, trapped in a cave. He's ripping pages out of his dad's book and tossing them into a dying fire when none other than Dad Queen's hand grabs his shoulder. Being a ghost looks like it must be a tiring experience. I'd be mad about not being able to change out of that jacket. At the offices of legal aid clinic CNRI, Laurel is freaking out. The organization's biggest donor (who is apparently Simon Stagg) has pulled out funding, putting the whole operation in danger of going under. So, of course, this is the time Tommy Merlyn shows up and offers to whisk Laurel away on a trip to Coast City, as a way to get to know each other better. (This after a mention of Keystone City as a place the Royal Flush Gang hit earlier. How come every other DCU city gets to keep its comics name?) Laurel shoos Merlyn away. Ollie and Thea walk the halls of the Queen home talking about how their mom might be a little down now that her husband has basically left because of that whole thing where he found her family's old wrecked yacht and then a guy ended up dead. You think? Moira walks in to announce that she's scheduled a brunch with wunderkind Carter Bowen and his mother. Ollie and Thea try to talk their way out of it, but Moira insists and oh I guess this is a show about brunch plans now. The exciting brunch planning action is interrupted when Dig calls to tell Ollie the Glades water/power baron has apparently tried to commit suicide out of fear of getting Arrow'd. Ollie brushes off an offer to drive around recklessly from the arriving Merlyn and jets off to the hospital. While Merlyn's in the house, he figures he might as well ask Thea for some romance advice; a flattered Thea tells him to show her he thinks what's important to her is important to him. No names are ever mentioned, so I think you have a pretty good idea of where this is going. Ollie arrives at the hospital to discover Dig's call was all a ruse (the number one clue is Dig saying he lied) to get him to talk to the wife of the cop who got shot during the bank robbery. 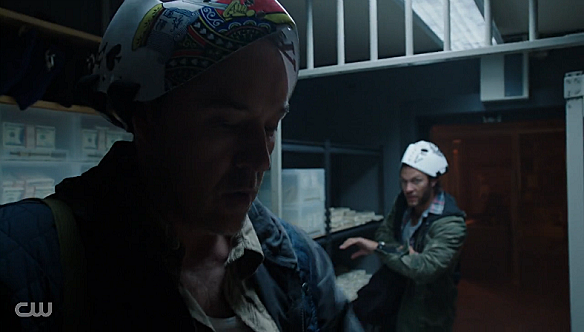 The guilt trip does the trick (Dig really lays it on thick), and Ollie tells Dig it's time to go nab some bank robbers. Dig and Ollie return to the Arrowcave to watch some surveillance footage of the robbery, which I guess they are just streaming on Netflix since we have no other explanation for how they're watching it. They notice that Ace had a school ring on, which Ollie seems convinced will identify the guy. They can't get a good look at it in the footage, though, so Ollie goes to the police station, where he has to evade an angry Detective Hilton so he can grab a photo of the impression the ring made on a victim's face. Seems a little convoluted, doesn't it? By the way, where's Detective Lance this week? Did he go to rehab after that bender that capped off last week's episode or what? Anyway, Merlyn's hanging out at CNRI, where he's taking Thea's advice and showing an interest in what Laurel's passionate about. He tells Laurel he wants to sponsor a benefit for the clinic, and though she initially bristles at Merlyn's attempt to win her over, Joanna tells her it would be dumb to turn it down. So Laurel gives it the green light. 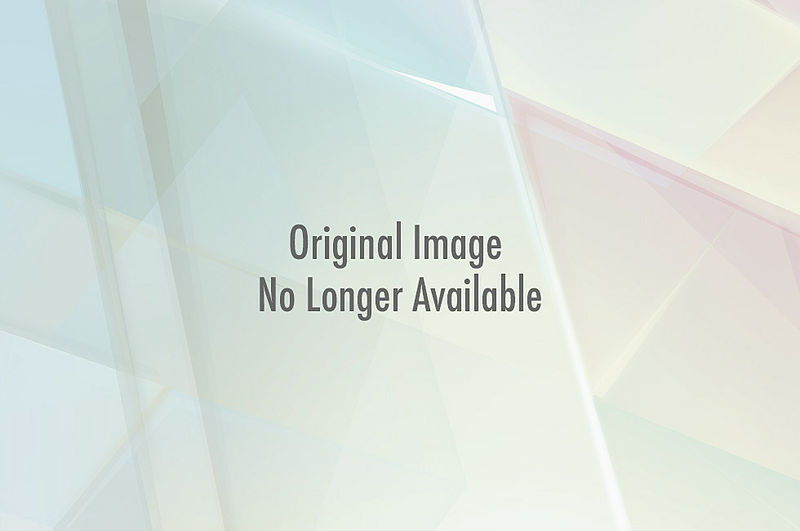 Ollie has found the photo of the seemingly perfect indentation Ace's ring left on the bank manager's face. I mean, look at this. Was his ring a branding iron, too? The ring comes from Larchmont High, information Ollie magically uses to find the name of Kyle Reston, a dropout whose entire family went missing just before his senior year. That's right, it's a family gang! Like the Beagle Boys! Ollie also deduces that one of the women inside the bank was the family matriarch, since she clearly didn't come out with the other hostages. But no more time for investigation, because it's the brunching hour! The Bowens and the Queens make the smallest of small talk -- Carter's agent says Ollie's life story could be a movie, there's a thing were Ollie doesn't know who Dr. Oz is, real riveting stuff -- while the Royal Flush Gang embarks on another bank robbery across town. Dig enters to alert Ollie about it, and Ollie bails on brunch. How could he do this? At brunch, of all times! The cops, the Royal Flushers and Arrow engage in a big shootout underneath the bank, in which Arrow ties the money to the ground with some kind of duffel-bag-securing arrow. That's so cartoonishly ridiculous I kind of have to love it. 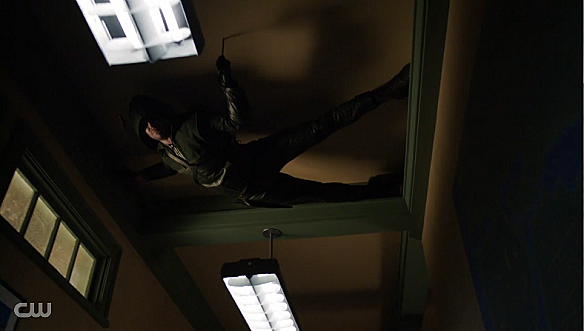 The cops notice that Arrow is there and try to grab him up, so he shoots out the lights, essentially giving the gang an opening to escape. Whoops! Out under a bridge somewhere, the Royal Flushers debate whether Arrow showing up like he did maybe means it's time to get out of the bank robbery game. But Jack and Ace insist they have to steal enough money to be "set for life," not "just OK," so they decide to rob one more bank. If they've already hit dozens of banks, I don't know how just one more would be the difference between "just OK" and "set for life," but I'm no accountant. At Queen Consolidated, Dig and Ollie have Felicity Smoak digging into some information on the Reston family. The dad, Derek, was a former steel factory employee of Queen company, one of a bunch who lost jobs with no severance when the company shipped all the jobs to China. I guess they ought to be glad only one guy's family started putting on hockey masks and robbing banks. On Flashback and Now Also Ghost Island, Robert Queen pulls the gun he used to shoot himself out of his pants and tells Ollie there's a bullet left if he wants it, though his own death becomes meaningless if Ollie dies. Ollie says he's starving and wants his death to be quick, so he puts the gun to his temple and pulls the trigger. Welp. Ollie actually died five years ago. Show over. It's been a good run, guys! And yet here's another scene in the present. Ollie tells Dig he's going to check out a bar where all the factory workers used to hang out in hopes of Derek Reston being there. Dig tells Ollie he's not responsible for the Restons' bank-robbing ways, but Ollie insists on making things right. After a scene in which Merlyn tells Laurel how he's tired of bed-hopping and feels like their relationship really means something, Ollie does indeed find Papa Reston (who is not, as far as I can tell, an android), playing poker at the bar. Not a great way to hide your card-themed bank robbery outfit, fella. Ollie sort-of apologizes for his dad laying Reston off and indirectly tells him to lay off the robberies. Ollie also offers Reston a job, which he turns down because "I don't need charity from the son of the guy who screwed me over." I'm not sure how a job is charity, really, but the point is he's still got a chip on his shoulder. He's also got a bug in his pocket, because Ollie put one there on his way out. Ollie overhears that the family's going to do one more robbery because Kyle demands it, as if we didn't already know that. In a whiskey cellar somewhere, Merlyn's hosting the benefit for CNRI. Thea arrives to discover that Merlyn was asking her for advice for Laurel rather than herself and feels pretty bad about it, so she chugs some wine. Laurel butters Carter Bowen so she can take some of his money and Merlyn gets jealous. Ollie apologizes to Moira for ruining that all-important brunch but then Dig tells him the robbery has started and has to leave anyway. She mad. The Royal Flushers have broken into another bank after-hours. They knock out a guard and quickly bust into the vault, where they take their masks off for reasons I cannot begin to fathom. Pretty sure vaults have security cameras in them, guys. They hear a sound and Ace goes to check it out. Arrow calls him by name and shoots an arrow at him, which Ace blocks with a riot shield. On the second try, Arrow hits Ace in the shoulder. They fight for a bit, until the security guard rouses and threatens Arrow with a rifle. 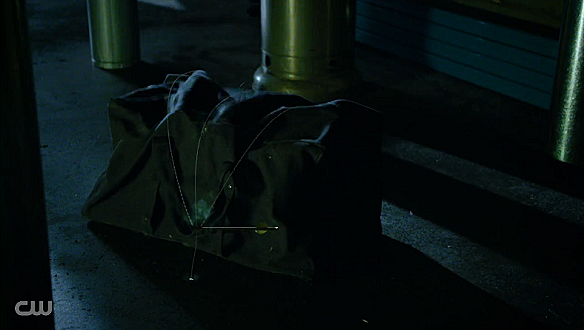 Derek comes running out of the vault and the security guard takes a shot at him, hitting Derek in the stomach. Arrow knocks Ace out. He and the scared security guard see that Derek is bleeding pretty badly, so Arrow orders the guard to "call an ambulance...NOW!" as opposed to, I guess, sometime next week. 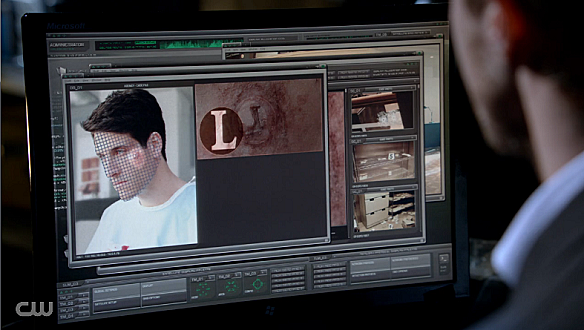 Arrow reveals who he is to Reston, who asks about his son. Arrow says he's OK, just knocked out. Reston says it's not Kyle's fault he robbed banks when Ollie flashes back to the island. Turns out that imaginary ghost gun didn't work after all. Ghost Dad, who I'm really considering calling Nor-El, is real upset about Ollie pretend killing himself, and tells Ollie he's got to right his wrongs. Reston is dead, by the way. Ollie pulls his hood back up and gets out of there, leaving Kyle behind to presumably go to jail. At the fundraiser, Thea is trashed. She's trying to get all up on Merlyn and saying mean things and knocking over innocent waiters. Merlyn takes Thea outside for some cleansing vomit times when Laurel comes out to see if everything's OK. Merlyn says it's all fine and she can go back to dancing with that Bowen guy we'll probably never see again. She says she only danced with him because he wrote a big check and this is all pretty much what we thought it would be, isn't it? One more flashback: Ollie's still in the cave, and that fire's still flickering. 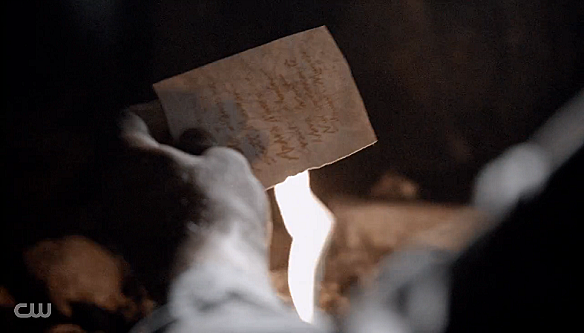 He tears out a page and starts to toss it in the fire when he notices something weird about it. With those bag-constricting arrows from earlier and now invisible ink, I'm starting to think the translation from Mandarin isn't Purgatory at all, but Toontown. Ollie holds the entire book up to the fire and the list of names magically appears. He tells his dad he promises to do...something, and we flash back to the Queen house, where Moira is having a sadness drink. Now that Steele's gone, she's lonely and she wants to spend time with Ollie (that doesn't involve having masked men kidnap him). So Ollie takes her to Big Belly Burger and she tries to eat a burger with silverware because she is a fancy rich lady. I am so glad this is over. The romance stuff between Thea, Laurel and Merlyn was contrived. The Royal Flush Gang had just one good trick up their sleeves (putting the hostages in the masks). Plus, they just ended up being sad. Even Dig, who is usually a bright spot, found himself in this weird position of goading Ollie into taking on some small-time bank robbers instead of a parasite who preys on poor people. It's only a coincidence the gang tied back into Ollie's dad at all. The island flashbacks had Nor-El instead of Proto-Arrow or Deathstroke, and I think that hurt them, too. No sign of the present-day meta-plot either. I don't begrudge the writers for trying to figure out ways Ollie won't have to fight another evil businessman in a suit every week, but they're going to have to do better than this to make it happen in a way that doesn't make me think guy-in-a-suit might have been the way to go after all.